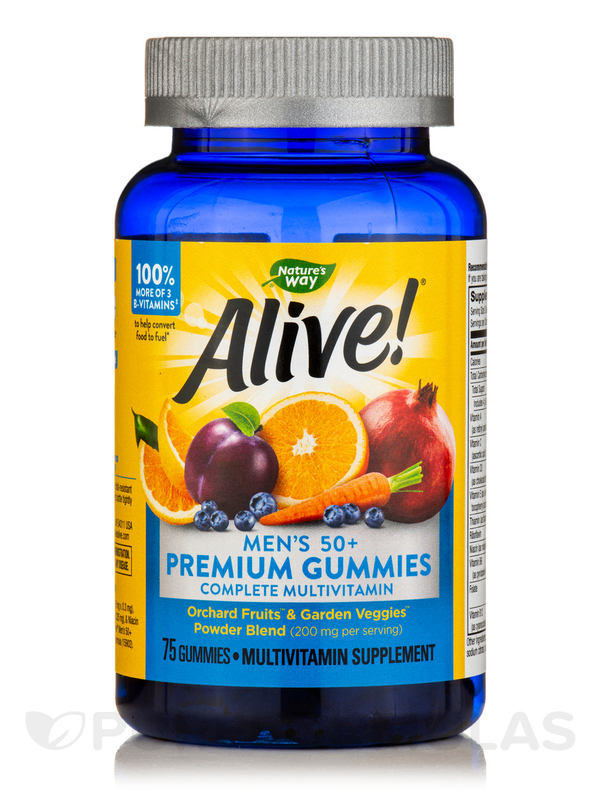 Alive!® Men’s 50+ Gummy Multi-Vitamin – 75 Count from Nature’s Way® helps nourish your body and boosts energy levels. This vitamins and minerals formula could potentially support heart healthy living‚ maintain prostate health‚ and strengthen bones too. Vitamins and minerals reportedly help your body perform many important processes and functions. These nutrients appear to support the health of your organs‚ cells‚ bones‚ skin‚ hair‚ and eyes to promote your general wellness. Studies reveal that vitamins and minerals boost metabolism of carbohydrates‚ proteins and fats‚ produce energy‚ aid digestion‚ and keep away heart conditions. They may also destroy free radicals‚ combat inflammation‚ increase bone strength and density‚ and support reproductive health. 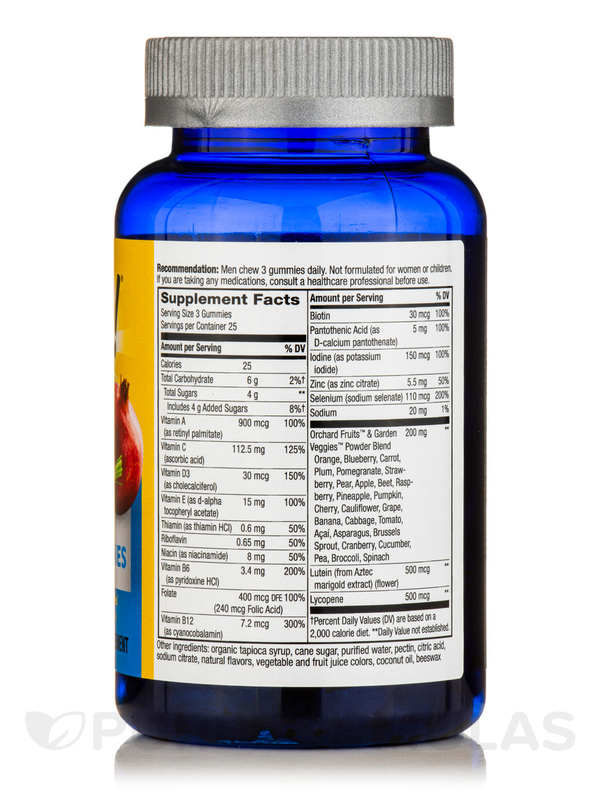 The presence of organic fruits and vegetables in this dietary supplement from Nature’s Way® reportedly improve digestion‚ elimination‚ and detoxification functions. These may provide important nutrients to your body‚ increase stamina‚ keep away infections and inflammation‚ and develop your overall health. Reports suggest that lycopene‚ from tomato extract‚ has powerful antioxidant properties. It may protect cells from oxidative stress‚ support certain facets of heart health‚ and maintain healthy prostate function. 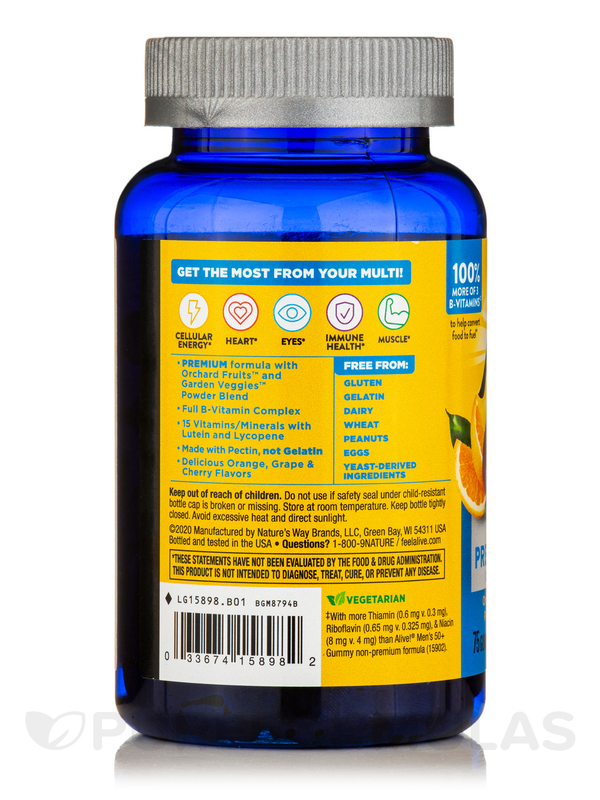 Lutein in Alive!® Men’s 50+ Gummy Multi-Vitamin – 75 Count from Nature’s Way® could potentially prevent macular degeneration and keep away conditions related to your heart and colon. Evaporated Cane Juice‚ Organic Tapioca Syrup‚ Pectin‚ Citric Acid‚ Sodium Citrate‚ Natural Flavors (cherry‚ grape‚ orange)‚ Colors from Natural Sources (maqui berry‚ black carrot‚ beta carotene)‚ Fractionated Coconut Oil (non-hydrogenated)‚ Beeswax‚ Soy Lecithin (non-GMO). Adults chew 3 gummies daily. Gummy appearance may change over time due to natural color. This does not alter product potency. best vitamin I have ever taken.